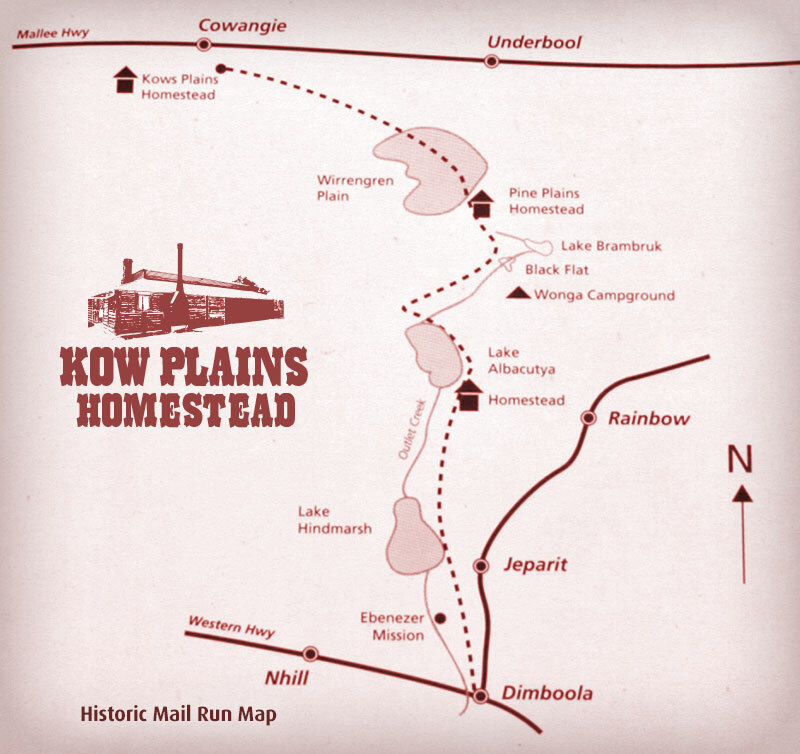 Two events depicting the re-enactment of the Pine Plains to Kow Plains Mail Run took place during the Queens Birthday weekend. 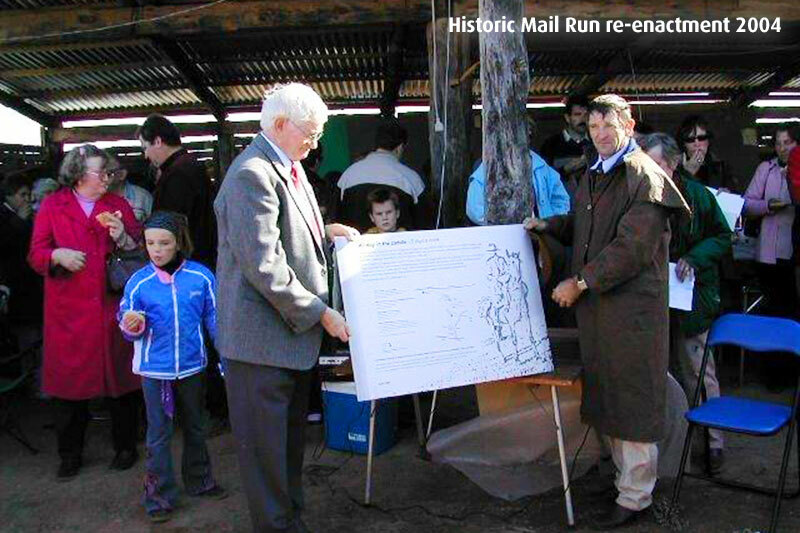 On Sunday the 13th June, 2004, a large gathering including over 50 descendants of the O’Sullivan family gathered at the entrance to Pine Plain Station to witness the arrival of the mail man Hugh O’Sullivan grandson of the mailman Owen (Hugh) O’Sullivan who in 1883 at the age of 14 carried the mail from Dimboola the then railhead to Kow Plains. He spent Saturday and Sunday nights at his home at Albacutya on Monday he rode to Pine Plains on Tuesday to Kow Plains, Wednesday back to Pine Plains on Thursday to Albacutya, Friday to Dimboola and then back to Albacutya where he had Sunday’s off. Hugh O’Sullivan did this for about 8 years with only one exception. 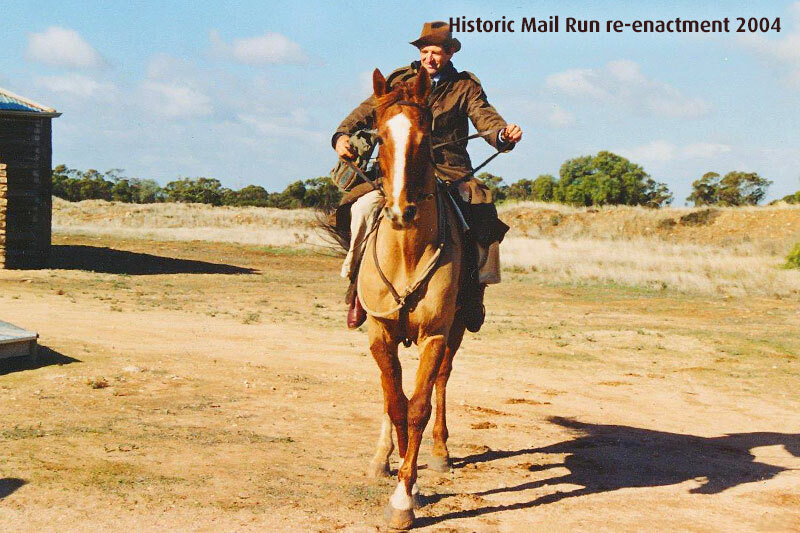 On Monday 14th June in cold windy and damp weather the Mailman Hugh O’Sullivan rode into Kow Plains along part of the original track. His arrival was announced by Terry Gibson. Hugh tied his horse to a pepper tree near the Cookhouse and proceeded to the stable where he handed the mail carried in one of the original mail bags to Dugald Macpherson great grand son of Dugald Macpherson lease holder from 1867 to 1897, who read the letter from the Governor of Victoria John Landy to the Kow Plains Committee and the Cowangie Community. 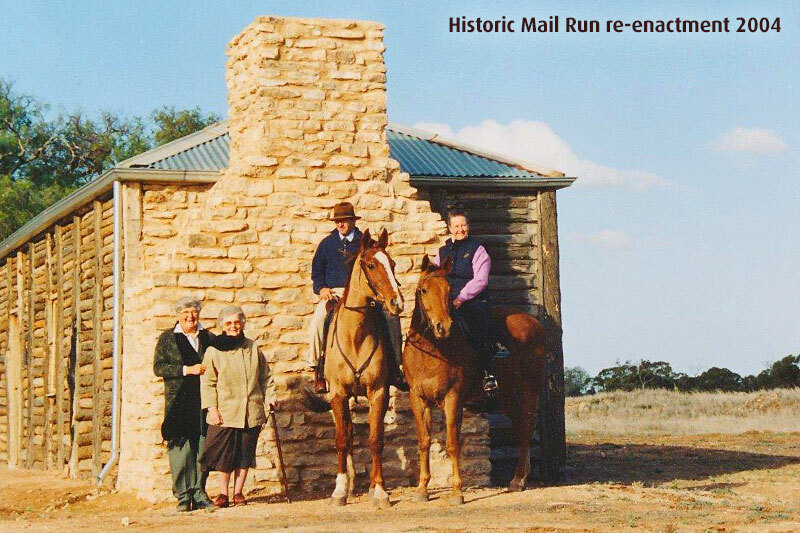 Jocelyn went on to say that this event also marked another stage in the restoration of the Kow Plains Complex, the completion of the west wall and part of the south wall of the stable made possible by the donation of logs from an old stable at Graham & Jean Wake fields Walpeup. The cost of labour was funded from the sale of books donations and funds raised from functions; she thanked the builders Terry & Tim” Dudgald Macpherson and Hugh O’Sullivan were called forward to unveil the interpretive plaque which was covered with an Australia Post banner. 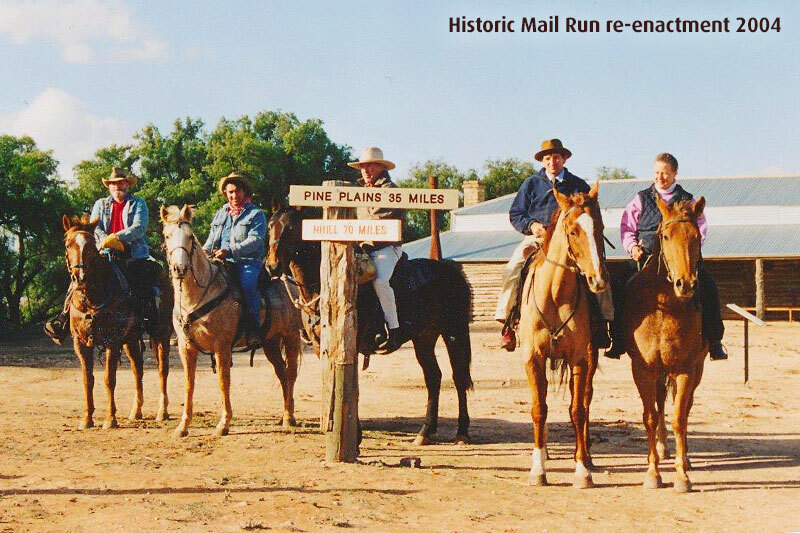 Dugald commented on the importance of the arrival of the mail man the only connection with the outside world in those days and said how pleased he was to be part of this historic event. A BBQ lunch was enjoyed by all. After a lingering illness, extending over several months Mr. Owen O’Sullivan (who was familiarly known as Hughie) breathed his last at his residence, Ryan Street, Rainbow, on the morning of Friday March 19th 1929. Deceased who was 59 years of age was born 1870 at Linton near Ballarat, and attended school at Happy Valley Wycheproof. Shortly after leaving school at the age of 14 years, he accepted a contract to carry mail from Dimboola to Cow Plains, the journey there and back occupying a week. Leaving Dimboola at an early hour on Saturday mornings he would travel via Jeparit to the Lake Albacutya Station (at that time the property of the New Zealand Loan and Agency Co.) the first day, resuming the journey on the second day he would reach Pine Plains Station owned by Mr Septimus Miller) arriving at Cow Plains Station (the property of Dugald Macpherson) on the third day. The return journey occupied three days the same stopping place being observed. Deceased followed this occupation for several years the track from Jeparit northward skirting the eastern side of Lake Hindmarsh, a three chain road west of Rainbow town common and continuing in a north-easterly direction leading to the Albacutya Station. Deceased frequently referred to a sensational experience he had near Antwerp in 1889, when returning with mail from Cow Plains. On the outward journey there was no indication of rain, but shortly after leaving Jeparit a heavy downpour set in and increased in severity during the next couple of days causing the Wimmera River to overflow its banks, with the result he had to swim across the flooded road. Fastening the mail bag to the horses head he assessed the task of leading the animal by the reins and after an exciting struggle in the swirling stream the deceased and his horse reached terra firma in safety. Subsequently the deceased lived with his parents at Lake Hindmarsh near Jeparit. 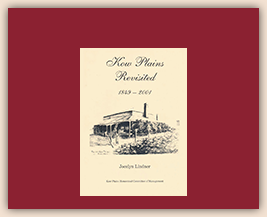 He acquired a mallee block about three miles north of Rainbow, where he successfully followed agricultural and grazing pursuits for many years. Some 20 years ago deceased took up his residence in the town and lived there ever since. Deceased a noted bushman and was acquainted with every inch of territory between Rainbow and the Murray. Many years ago the Police and black trackers were lost in scrub country north of Nypo and on suggestion of the Constable, deceased services were requisitioned to make a search for the missing party and he traced the wanderer to the area north of Hopetoun. 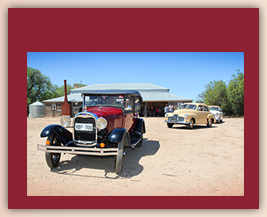 When the Wyperfield National Park was established deceased acted as “guide, philosopher and friend” to visitors to the park. 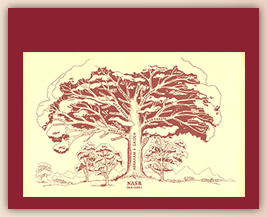 He took a keen interest in the National park and was a member of the committee and caretaker since its inception. In his younger day the deceased was successfully associated with Turf in SA and Vic and was a founding member of the Albacutya Race Club. For many years he held the grazing licence on Lake Albacutya frontage, and he also grazing leases of the bed of Lake Albacutya during the years it was dry 1902-1909. Afterwards he purchased the freehold of Pine Plains. Deceased married twice his first family consisting of seven children and the second one Eileen & Carmel. He was buried at the Rainbow Cemetery.